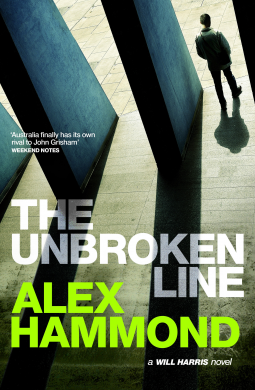 THE UNBROKEN LINE opens with its protagonist – Melbourne defence lawyer Will Harris – celebrating a partial recovery from injuries he received in events depicted in a previous novel (he is still taking strong painkillers but he’s out of a wheelchair). On their way home from the celebratory meal he and his girlfriend Eva are deliberately sideswiped then physically attacked. Will is told to back off but he doesn’t seem to know what the brutal messengers are referring to. I have to admit this book and I didn’t start off well together because I felt myself at a distinct disadvantage for not having read the novel’s predecessor, BLOOD WITNESS. I realise it’s a tough balancing act for authors of series books (just one of the reasons I wish more people would write standalone novels) but for me this one made too many oblique references to past events that left me scratching my head. When I accepted this role, I did so because I was aware of the grey trade in information that goes on within the justice system. Who knows how deep the roots of this go – police corruption is all too familiar to us, so why should lawyers be immune. I’m not just here to prosecute dodgy suburban lawyers who fudge their trust accounting to rip of their clients. I’m here to shut down this pervasive culture of exploited privilege and any criminal activity it supports. The legal system should benefit all its citizens equally, not just those with access to money and connections. In a well-constructed story involving a complicated series of interconnected events we learn that, perhaps not surprisingly, the reverse of this noble sentiment is often true. Having a character like Will at the centre of the action is a good choice for a novel tackling this kind of theme. Because Will does not always do the ‘right’ thing when it comes to seeing justice served. Whether he is forced or chooses to make the morally dubious decisions he makes is ultimately something the reader will decide but his struggles are realistic within the context of the events unfolding around him. I can’t say I liked Will all that much but I found him compelling and his turmoils thought-provoking. I know that in real life there are many more than fifty shades of grey but I like to use my crime fiction reading to help me pretend that in some parallel dimension you can always tell the good guys from the bad ones and justice ultimately prevails. Books like THE UNBROKEN LINE don’t really offer me that foray into fantasy land which is why they’ll never be among my absolute personal favourites. But you’d have to go a long way to find a more intelligent novel in which the realities of the legal system are laid bare enough to make readers hope they’ll never have to tangle with the system themselves.